- Look of "Four Brothers"
After their adoptive mother is gunned down during a grocery holdup, the estranged brothers unite to seek revenge and take matters into their own hands. Defying police orders, the four begin turning old Detroit neighbourhood upside down searching for the mastermind behind the brutal killing. Along the way, they are bound by ties thicker than blood. Once the familiar Paramount logo starts to fade out in a blanket of snow, all the suspense and action elements start to roll in this John Singleton (“Boyz N the Hood” “Shaft” and “2 Fast 2 Furious”) directed action drama. To begin with, Evelyn Mercer is a benevolent social worker who also acts as a surrogate mother to four young males. Rejected from one foster home to another, these rebellious young kids grow up to be social outcasts of sorts but deep down, their love for their surrogate mother remains. When their mother is shot in cold-blood during a holdup in a convenience store, these four males decide to get together to hunt down the killers. The plotting is simplistic enough, there isn’t much time for characters elaboration in fact. But there’s one crucial scene in which a cop (played by Terence Howard from “Crash”) is breaking down the four brothers’ characteristics to his rookie partner which basically summarises everything you need to know about them. Mark Wahlberg is Bobby, the leader of the pack and the one who dismisses any notion of thoughts. And the rest of the brothers, played by Tyrese Gibson, Andre Benjamin and Garrett Hedlund are equally outstanding in their roles. Perhaps there’s a strong indication of how different the characters and roles are in the script. With perfect casting and John Singleton’s direction, everything just falls in place nicely and fittingly. With each step the brothers took, there are more challenges ahead. As they move closer to the killer, one can sense how close these brothers are and these go to show the perfect chemistry the cast possessed. The car chase scene set in a heavy blizzard will not disappoint die-hard action fans. In addition, there’s a shootout at the Mercer household that will keep your adrenalin pumping. Despite some clichés towards the end, “Four Brothers” fares well as a decent crime thriller. No doubt, good casting contributes a lot to it too. Commentary by Director John Singleton - Listen to Singleton's commentary if you wish to know more behind-the-scenes stuff of "Four Brothers". Nothing extraordinary or particularly informative though. Look of "Four Brothers" (10.05mins) - Let the production designer and cinematographer brings you more details on creating the look of "Four Brothers". It's interesting to note that part of the facade from the Mercer House is recreated on soundstage and well, hard to notice any differences onscreen. The magic of film-making strikes again. Crafting "Four Brothers" (10.54mins) - Listen to how the screenwriters came up with touches and approaches to the script. Amazingly, the writers helmed from UK while the story is set in Detroit. Behind the Brotherhood (09.28mins) - Nothing really inspiring but you get to see Director John Singleton playing hockey with the cast and he gets to push Tyrese around. Male bonding that is. Mercer House Shootout (04.15mins) - The most interesting but the shortest feature of the lot. A behind-the-scenes of how the shootout sequence is conceived and background work carried out by the technicians. Deleted Scenes - Altogether there are 5 deleted scenes, mostly ranging in seconds to a minute, longest being the "The Brothers Eulogy" running at 2 minutes. Fortunately, none of them are crucial to the plot and you can get a good laugh at the "Bobby teases Jack" sequence however. 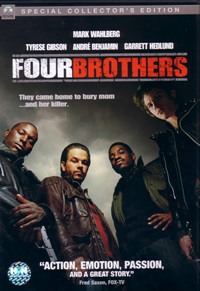 Presented in Dolby Digital 5.1., this special edition of "Four Brothers" is a hoot in the gunfight, shootout sequences. It's akin to putting yourself in the middle of the fights with the surround and rear speakers blasting off. As the movie is shot in wintery conditions, there's a great reliance on the colour white. Not really a distraction, in fact it looks marvellous especially the end scene.